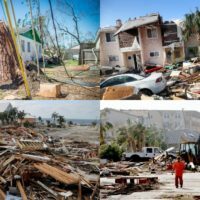 Calls mount to label Hurricane Michael a Category 5 storm | Insurance Litigation Group, P.A. According to the Sun Sentinel, Some Florida Panhandle county officials are pushing for Hurricane Michael to be labeled a Category 5 storm. These officials want to label the October storm a Category 5 as a leverage to try and win a higher reimbursement from FEMA, but also as validation and a badge of honor for a region that feels forgotten by the rest of the nation. Per the conventional Saffir-Simpson Hurricane Wind Scale, the standard used by the National Hurricane Center based on sustained wind speeds, Hurricane Michael was a strong Category 4 with measured 155 mph sustained winds upon landfall- 2 mph under Category 5 status. If you have experienced an insurance loss from #HurricaneMichael, don’t be surprised if the insurance company’s first reaction is to claim that your damage is due to some pre-existing condition or assert that your claim is not covered under the terms of your policy or even cancel your policy based on recently-discovered “errors” in your application. But don’t worry. Experienced and aggressive attorneys from ILG are on your side and will advocate on your behalf to see that you get the benefits you are entitled to. At ILG, we take the time to analyze and interpret your policy and understand the full measure of damages available to you. We work with construction experts, restoration professionals and others to determine the facts. Don’t delay and contact us today for a free consultation in Florida. The Insurance Litigation Group will walk you through the terms of your insurance policy and help you recover the full extent of your covered losses.